Ah, there sits my adversary of the week. 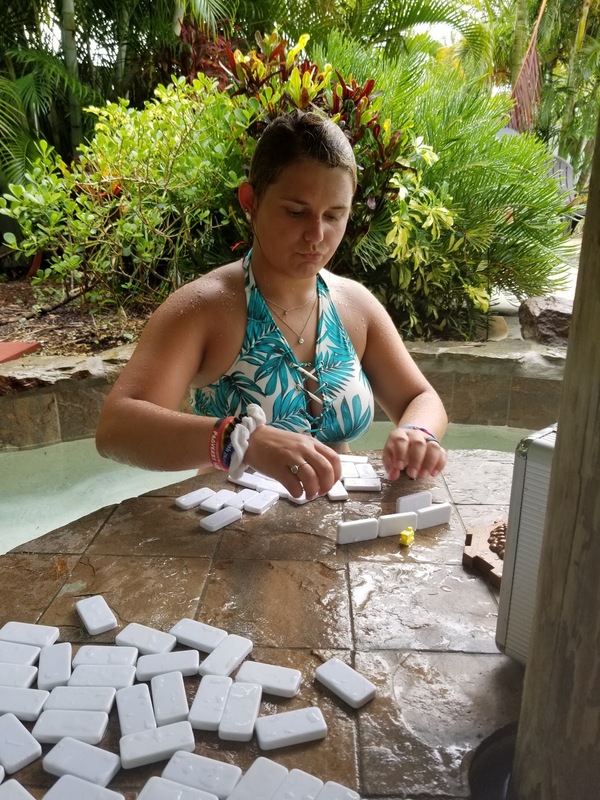 Daily contests of wit and luck over domino tiles. She bested me three out of four, I carried only the final match. I've raised her to find value in winning. Sure it's how you play, but it's also learning to win. She won with grace, I lost with humility. Well, for the most part. We also bully a bit and make good natured fun of one another. I think that can be healthy too. There are vacations that end with a feeling of relief. You're glad to be returning to your home. Then, there are those vacations that you say goodbye to with a bit of pain. It just doesn't feel like it's time to leave quite yet. Oh, to add another day. That would feel like a gift. We've done that before, but it is not for this trip. I like how the Europeans call vacations a holiday. This has been a holiday in the literal sense of the word. It has been holy, set apart. Time taken specifically to be together. To laugh, to disagree, to play... to find each other again as we all contine to grow and change. We've reflected on the past year and we like where we've been. We appreciate the path. Our little family, myself, Kellie, Caleb, Aleksandra, and Sterling all now share memories of the past six years. Our family and our life-long friends, the Roh family, now share some twelve years of memories together. We've lost count of our times of holiday together. And so I sit on the patio, beneath an umbrella table as the rain falls and drips behind my bare back. This falling water feels right. I'm mourning the leaving a bit, even though I'm anticipating our arrival home and greetings by our dogs. The vaction, the holiday. We all need a time of rest. A cycle of work and reflective recreation. It's how we're made. I am thankful for this time.